The township of Naseby in the Maniototo has become the country's curling capital with the completion in 2005 of New Zealand's first dedicated indoor Olympic curling rink (currently the only dedicated indoor curling rink in the southern hemisphere). Curling was introduced in Central Otago during the 1800s, probably by miners passing the time when frozen winters made working impossible. 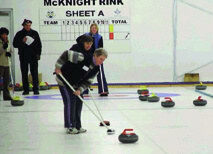 Curling season is now 7 days a week, from 10am till 5pm, and year round. Evening curling by prior arrangement. The game is easily played by all ages and any number of people can play. Fees are $18 per adult per hour, which includes tuition, stones, brooms and ice time. Our all-weather venue includes a lounge bar, viewing area, changing rooms and conference facility. Bookings advisable. .